Indian Dahl is a traditional curry dish from India that’s perfect for vegans, vegetarians or anyone else that enjoys a spicy lentil dish. It is loaded with nutrients and is a healthy source of fibre. This version of Vegan Indian Dahl is the perfect dish to cook in big batches and refrigerate or freeze for later. We found that cooking the Dahl in a large saucepan to be simple, authentic and just as (if not more) flavoursome than any other method. Gerri, being a chef, likes to work with her food, look at it, stir it and make adjustments to the flavour as it cooks. So do the guys at our local Indian restaurant. Such an easy and delicious dish that doesn’t need to be spoiled with modern contraptions. Indian Dahl and most other curries are simple, earthy dishes that are a real experience to cook. 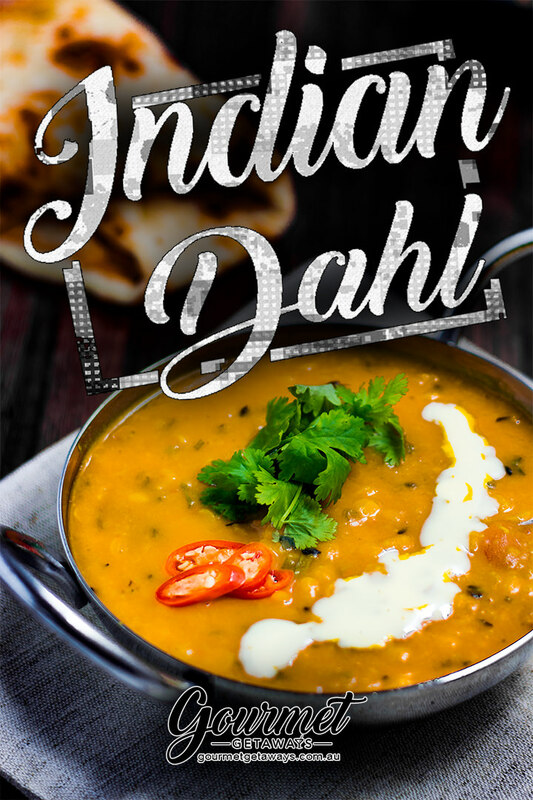 “Indian Dhal is a curry of spiced lentils that is not only vegetarian but 100% vegan”. 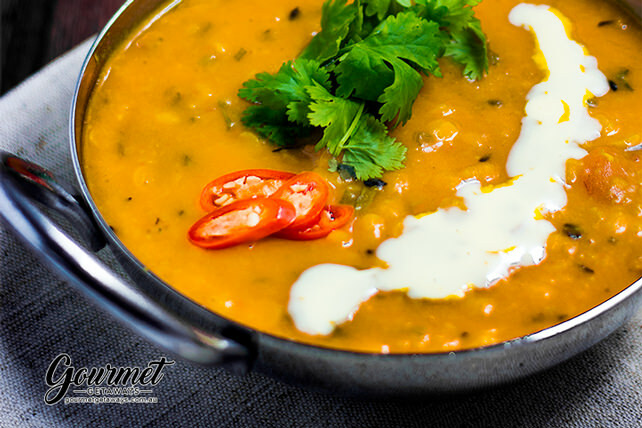 Indian Dahl is traditionally served as a side dish with naan or chapati bread but is just as popular as the main dish. I’ve seen Dahl, and other Indian curries served in styrofoam cups at city markets, as well as attractive dishes at Indian restaurants. Place a large saucepan over high heat. Add the coconut oil. When the coconut oil had melted, add the onion, garlic, ginger and mustard seeds. Cook until the mustard seeds start to pop and the onion is translucent. Add the garam masala, cumin, turmeric and chilli powder and saute for 5 minutes until fragrant. Add the lentils and stir to coat with the spices. Add the vegetable stock and tomato, bring to the boil, then reduce to a simmer. Simmer, stirring occasionally, for 30-40 minutes until the lentils have softened. Add more liquid if the lentils start to dry out before cooking through. Serve and enjoy with a side of Chapati Bread. When the coconut oil had melted add the onion, garlic, ginger and mustard seeds. Cook until the mustard seeds start to pop and the onion is translucent. Add the lentils and stir to coat with the spices. Add the vegetable stock and tomato, bring to the boil, then reduce to a simmer. Serve immediately. Enjoy with a side of Chapati Bread. Want to cook a larger batch of your Indian Dahl curry recipe? Just adjust the serving amount in the recipe card above.